As requested by a Florida customer, here’s a very unique custom aluminum awning design with clamshell awnings mounted on posts. 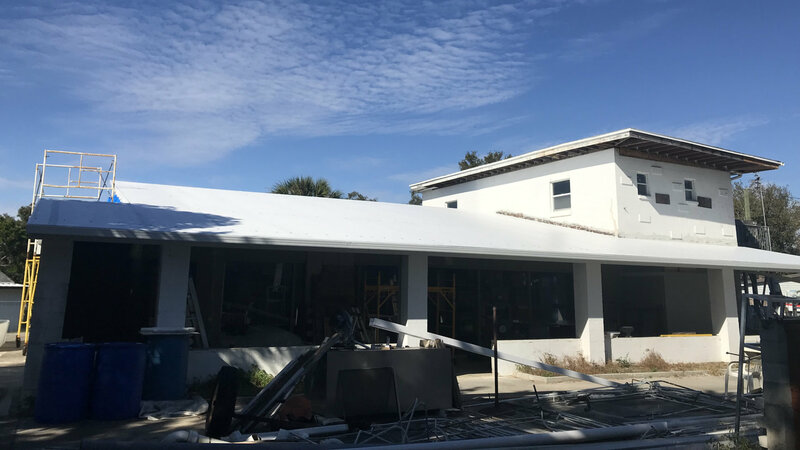 Each of the awnings are attached to the building and two forward posts to provide shade for a cement slab and sliding glass doors. Unlike window awnings, these are semi-permanent at a fixed angle until the posts are removed and bolted down for severe weather. The 2×2 aluminum posts are connected to the clamshell awning and slab with removable bolts to lockdown the awning if ever needed. 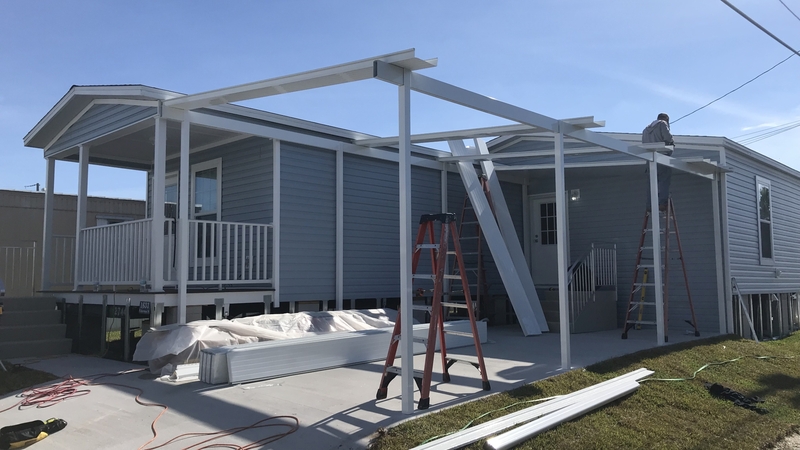 Do you want Haggetts Aluminum to build a custom designed awning for your mobile home? Call 321-978-5500 for a quote. 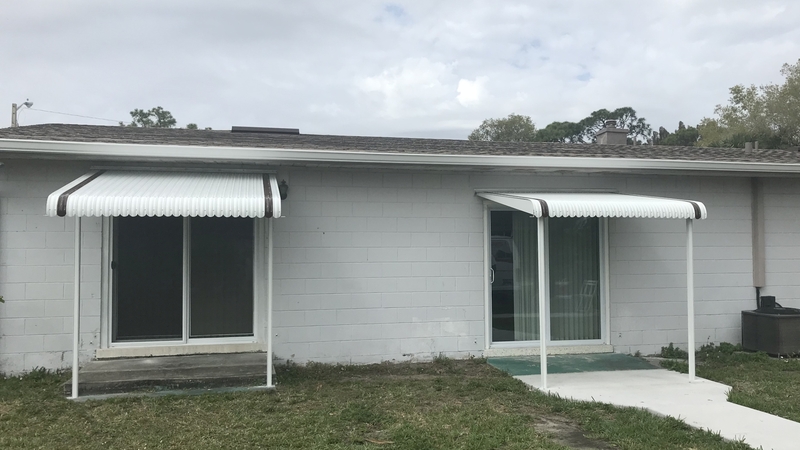 This multiple seeview awnings installation was recently completed for a newly remodeled home located in Melbourne, Florida. 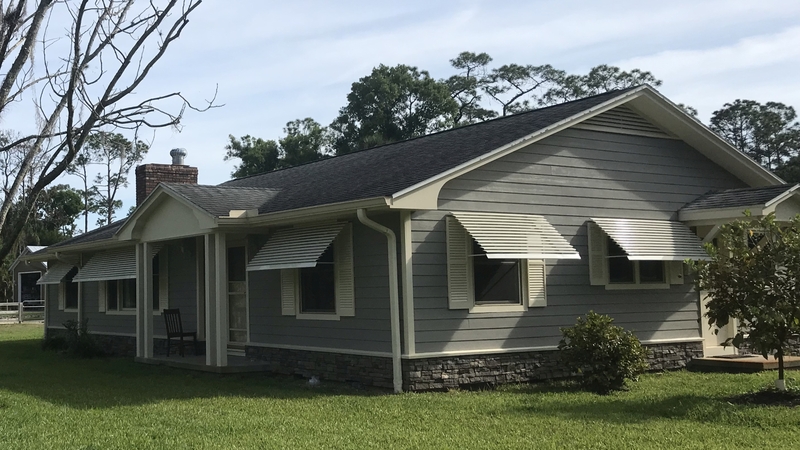 This project was designed to provide seeview style awning shade for all of the windows including single and double as shown. The seeview awnings provide excellent shade and visibility from inside. The owner was not concerned about storm protection. 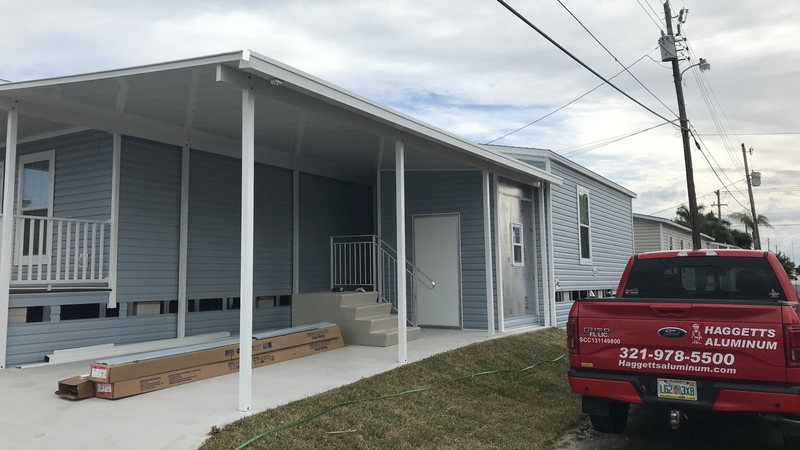 Haggetts Aluminum takes pride in high quality work including custom awnings for your mobile home. Call 321-978-5500 for a quote. 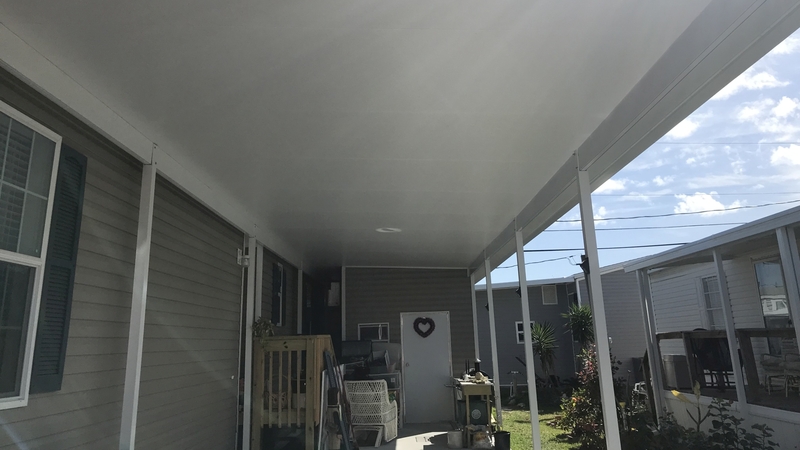 A recent Merritt Island manufactured home upgrade project involved a Haggetts custom designed carport and storage shed addition. This first photograph shows the early phase of construction with the carport and roof being framed prior to adding the storage shed. The 13’x42′ carport was designed with 3″ roof pans to reduce cost, and then we built the 6’x8′ wood framed shed under the carport roof. In the finished photo above the carport and shed are finished for the park owners of this new home, and customized to their needs. Anyone purchasing or setting up new homes can contact us for estimates or alternate designs to establish a budget prior to putting the home in place. Haggetts are specialists for your custom designed awnings, carport, screen room, or storage shed for your mobile home. 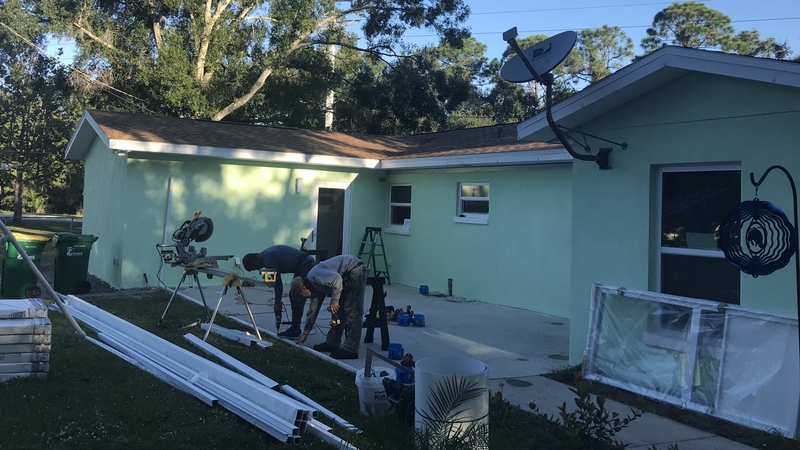 Call 321-978-5500 for a quote. 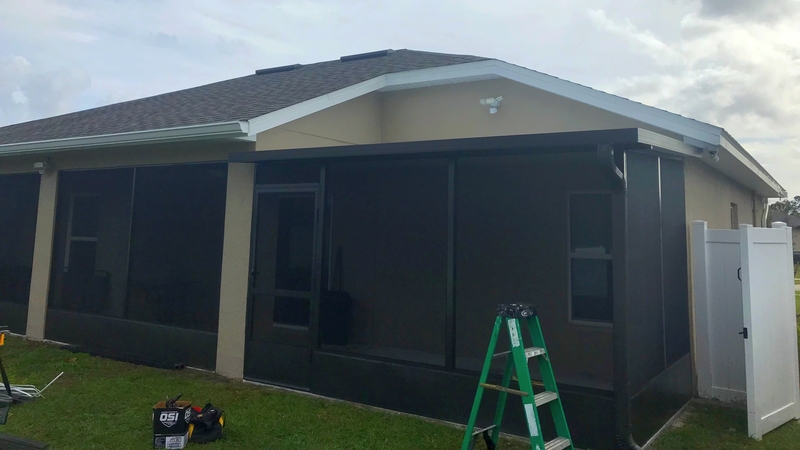 This two phase screen room addition and roof was an addon to a previous installation for this customer in St Cloud, Florida. The open patio area to the left was enclosed into a screen room, and then the 9′ x 12′ addition with the 3″ insulated roof was added. As a result, the covered enclosed space nearly doubled in phase two when the new roof and screen room were added to their home. Are you looking for a custom solution to enhance the outside of your home? A screen room adds shade and protection from insects or rain. 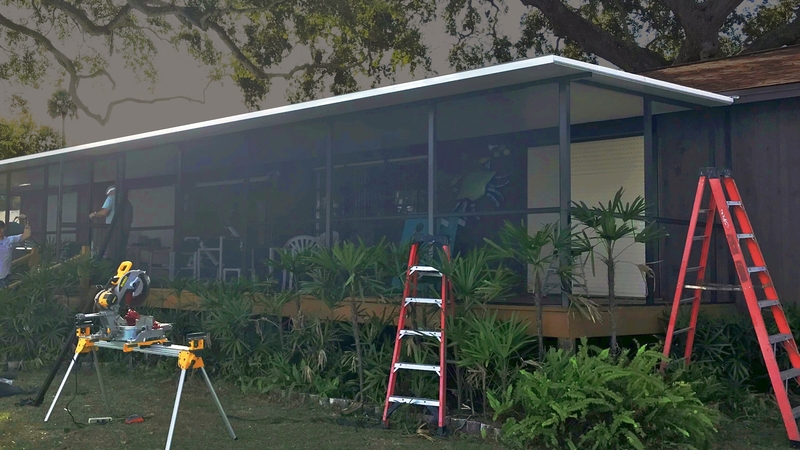 Trust Haggetts Aluminum for a custom designed awning, carport, or screen room for your home. Call 321-978-5500 for a quote. 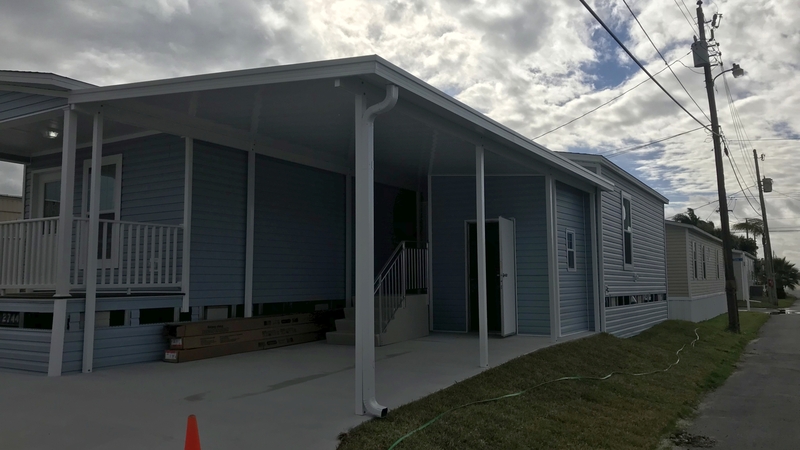 This custom screen room and roof project in Titusville, Florida, was a replacement after significant hurricane damage last year. 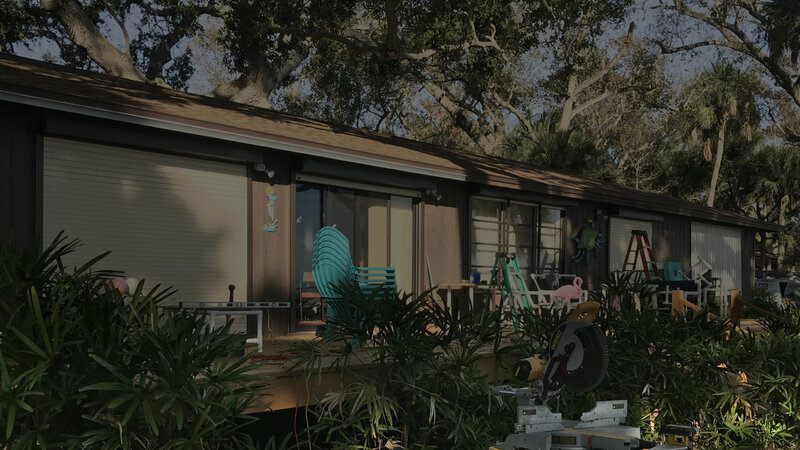 This first photo shows just the 12′ x 52′ hurricane damaged wood frame screen room deck minus the roof, wood frame, and screens. The customer wanted aluminum vs. wood, so we designed this replacement aluminum screen room and roof as shown and 99% complete. The replacement screen room frame is aluminum with aluminum doors, quality screen material, plus the new 3″ white insulated roof. Want Haggetts to quote custom design screen room options for your mobile home? Call 321-978-5500 for a quote. 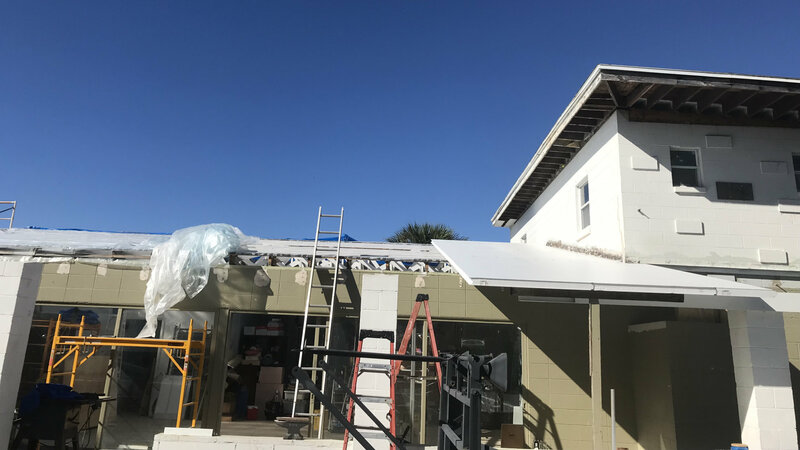 This Cocoa Florida warehouse roof project involved the replacement of rotted plywood and shingles to alternative 3″ insulated panels. The photo shown above is in the early phase of the project. It shows the bare roof where the plywood and shingles were removed, and part of the new insulated roof construction. This second photo displays the completed project prior to final cleanup of the construction site. This is a more efficient roof replacement compared to wood and shingles. The insulated panels may be a good choice for you depending on the application. Do you have a similar roofing replacement need? Call 321-978-5500 for a quote. 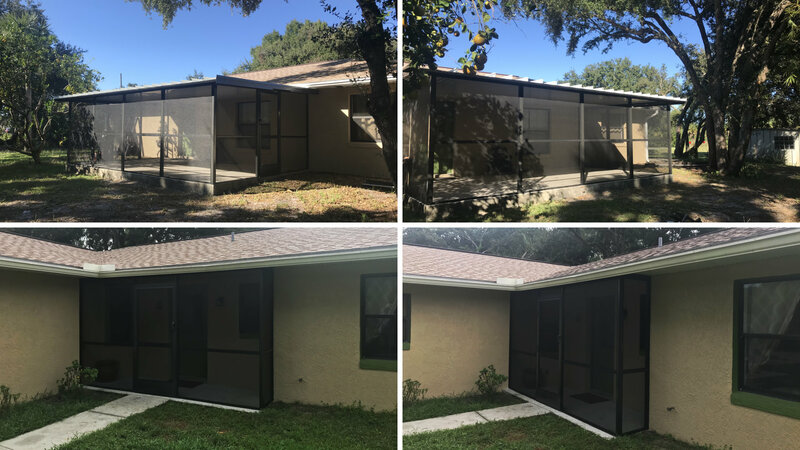 The custom screen room and screened porch displayed in the photo collage below shows a recent project completed in Central Florida. The two top photos show the custom screen room that we designed, built, and installed on a new foundation for a residential customer. The two bottom photos show a custom screened porch built on the smaller entry way on another side of the home with an existing slab. Enjoy the outdoors more in a screened in environment with a custom built solution from Haggetts Aluminum. Call 321-978-5500 now for a quote! 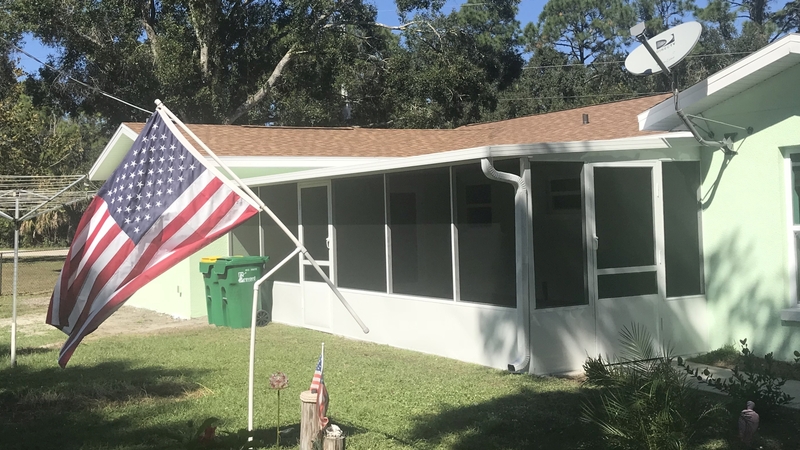 The Merrit Island SeeView awning project was a volume purchase by mobile home park owners of the Merrit Island Village in Florida. 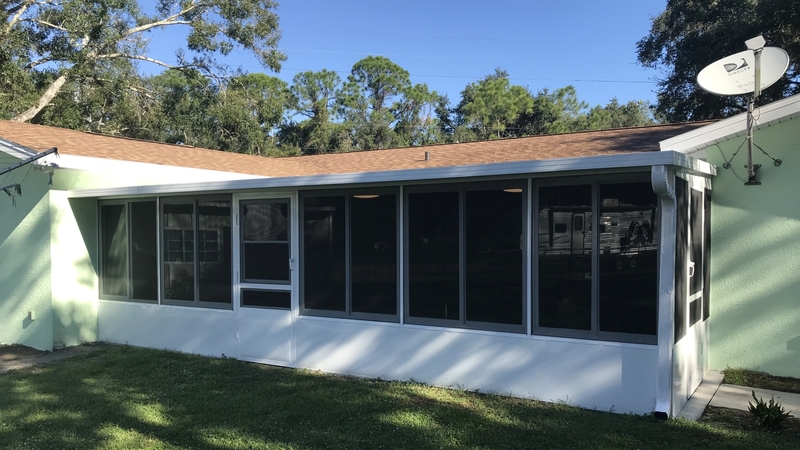 The photo above shows just one of the SeeView awnings installed on the front window of a mobile home in this 55+ seniors community. 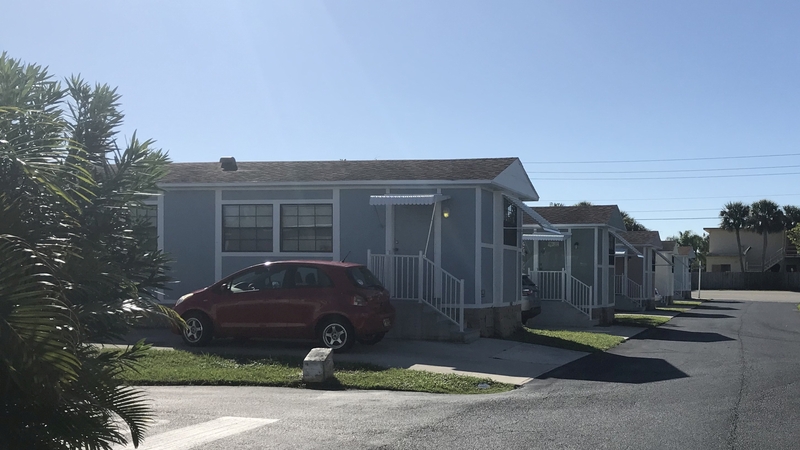 The next photo is a street view where multiple SeeView awnings were installed by Haggetts Aluminum on almost every home on the street. The slat design of the SeeView awning provides shade and protection of the mobile home interior, yet you still have outdoor visibilty. If you want to buy in bulk and save, please call 321-978-5500 today for a quote. 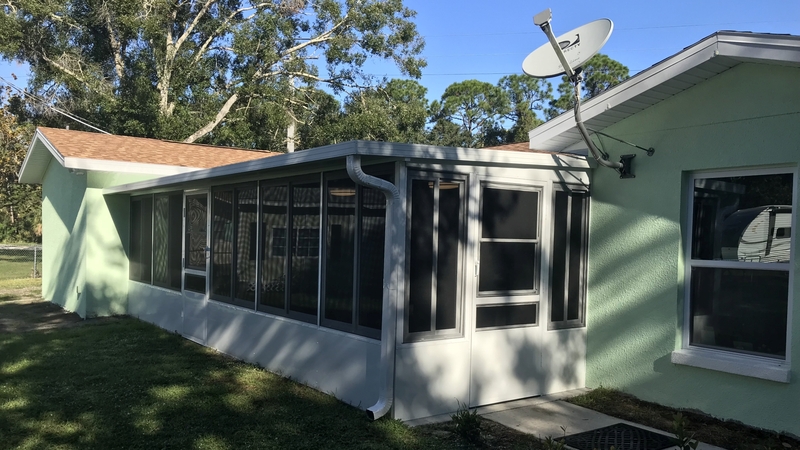 This custom 16′ x 28′ screen room with insulated roof and two doors was an addition onto an existing mobile home in Cocoa, Florida. The screen room project photo above shows phase one after the concrete foundation had been completed and we begin the initial layout. Next is the finished custom screen room with 2 doors and the insulated roof. The project will be upgraded later by adding windows. December 2018 UPDATE: The upgrade to add glass windows is done. Two new photos showing the new windows are inserted below. Thinking about a custom screen room for your mobile home? 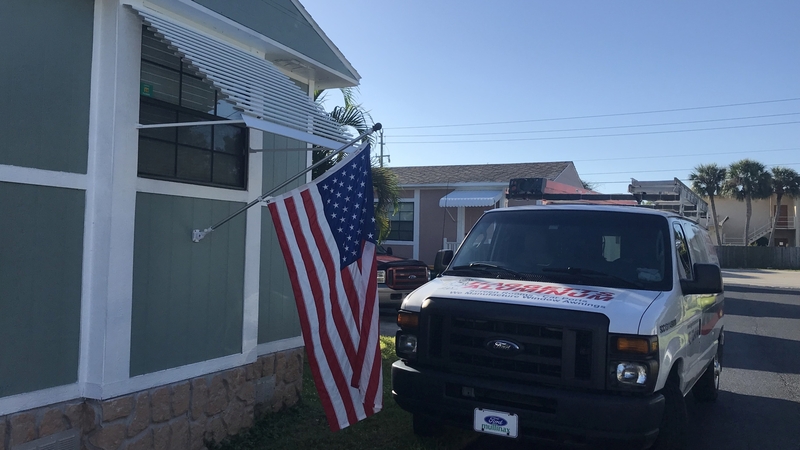 Call us today at 321-978-5500 for a free estimate.